I'm really confused now where this 'final' map pack is going. I thought it was just a texture problem holding up the release? Yeah, at first, but other problems surfaced. As I'm not going to release a v5, this is the last time to report and fix everything before v4 ships on 30/1. Just in case there are other... "surprises". In case you didn't notice, just opening a map perfectly optimized with Q3Radiant (q3map) and re-compiling it from GTK/NetRadiant (q3map2) may skrew up optimizations such as lighting. Unfortunately. And in some cases, it may even not compile successfully. First of all, I just realized an important thing about "corpse not gibbing" glitch. The corpse DOES explode also in V3 versions of those maps (DM4 and CTF3), but you have the time to see the beginning of the death animation, unlike what happens in DM7, where you immediately explode. I can guess there is some difference in the position of the triggers, or something similar. But in my case, the corpse did not explode at all was also related to the fact I forgot DO NOT LINK[/b]) h t t p s : / / openarena . wikia . com/wiki/Dmflags#Dmflags]DMFLAGS 1032 active (no self damage). However: with dmflags 1032, in V3 DM4 and CTF3 your corpse does not get gibbed at all when you fall in the void... while in DM7 it does. With dmflags 0, your corpse gets gibbed in all three maps, but in DM4 and CTF3 you did have the time to see the initial part of the death animation. V4 CTF3 has got immediate gibbing in both cases. I have no problem if DM4 is kept unfixed, the problem is less noticeable than I though before. - I have not understood: DM4 is the version from Akom, or has been modified? This post said it has not been modified, but in the .pk3 I can find some .ase "mapobjects" with their name starting with "akom4-". .bsp "last modified" date reports 05/12/2013. - DM5: I also noticed the thin "white dots line" Pelya noticed in this post. More, I just realized that some jumps from the outer platforms to the central platform are possible with 125 Hz physics, but not (or at least, I have not been able to perform them with a few tries) with 90 Hz or "accurate" physics. See first screenshot attached. I'm sorry, I should have tested this before. You decide what to do. - DM7: The V4Beta version has got some items dropped to the bottom of the void, and has got some parts too dark (especially the lower side of the arena). TEST version has still got too dark areas, and some new lights have something weird (are some red and yellow lights mixed?) -see third and fourth screenshots-. I don't know about the new item placement, maybe Moixie should tell... maybe this one may even be better, but however isn't it a bit too late to change map flow? - DM10: I'm not sure what Pelya means exactly with "it's a little dimmer": I think it's still the same map than V3, no? .bsp file modify date reports 15/01/2014, just like in V3 and V2 (15/01/2014 is the date I released udestruction beta version 18, which added "ambient 2"). Do you mean there is less difference between light and dark? May be the side effect of ambient light (I purposely used a low "ambient" number trying to limit this side effect, but...). Or maybe you did mean something else? - CTF2 I fear the bug I noticed here with bots standing still in that place, suspended from the ground, has not been fixed yet. I tried the map in Overload Harvester mode again (the only V4 map I tried with bots, for the moment), and after some time I found again Gargoyle where you see it in the second screenshot attached (standing still, suspended from the ground). - Zip file -> sources/mapsources.txt says "The maps are located inside of the z_oacmp-volume1.pk3 file.". I can guess it should mention "z_oacmp-volume1-v4.pk3". - Maybe the .pk3 file "sources" folder may contain a similar txt file, mentioning textures sources? However, that's already at the beginning of the main readme file, so it's not stricly necessary. Decide yourself. Yep, oacmpdm4 wasn't modified at all, but I was modifying it. In the end I've decided to rollback those changes and keep the v3 version untouched, so those models are leftovers of those changes which didn't made the cut. That part on dm5, I guess, shouldn't be reachable at all. dm7 has lighting as a pending improvement. I can rollback oacmpdm7 to the previous placement, but there was a huge overload of items. dm10 hasn't changed from the v1 release at all. About the ctf2 bug, are you sure you don't see the flag platforms? Because the three models are aligned with them, and those platforms are already aligned with the obelisk models. Note sure. Maybe we should ask what was Jan's idea? Maybe I misunderstood something from your post? Do you have some screenshot about the part you are talking about? What are you talking about ?? The only difference is in the light that has to be incremented in the .shader (in case of skybox) or by entity light (in closed maps). The geometry optimized rest as it is. Maybe not exactly. I think Neon_Knight said he had do to some "under the hood" hacks to be able to correctly compile some of your maps, starting from "making detail" many brushes (a thing I fear may negatively affect in-game performances). When he did a try with a customized version of Under Destruction, apart the quite different lighting, a few strange things happened: a part of the water started "blinking"... and some textures were scaled up (those textures scaled up also appeared to me when I tried to move to q3map2 last summer), and framerate was lower. His version was not so bad in general, but it would have required to spend a lot of time for fixing it. When he did a try with a customized version of Under Destruction, apart the quite different lighting, a few strange things happened: a part of the water started "blinking"... and some textures were scaled up (those textures scaled up also appeared to me when I tried to move to q3map2 last summer), and framerate was lower. His version was not so bad in general, but it would have required to spend a lot of time for fixing it. This happen in GTKradiant or in NETradiant ? Hi! I've prepared FIXED (meaning "corrected") mappools, that should be working (a quick try I did was successful). to reset it to its default (load a map first). Oacmp1_enable.cfg and oacmp1_disable.cfg files include brief usage infos. They do not control g_autonextmap variable, which should be set to 1 to use DO NOT LINK[/b]) h t t p s : / / openarena . wikia . com/wiki/G_autonextmap]auto change map feature. I renamed the .cfg mappool files NK previously did, to make thir names shorter: now the g_mappools variable does not become too long and do not cause the game to crash anymore. I haven't modified the maplists themselves. I hope I did not make mistakes, however you all are invited to check and test! NK, could you please just remove the old .cfg files from the OACMP package, and place those from the pk3 attached here instead? I think that should be enough. Thank you! When I tried, last Summer, I had problems compiling from GTK Radiant, NetRadiant and Q3map2build, IIRC. They did compile the map, but the map showed some differences I did not know how to manage. I'll replace them if they're correctly tested. About GTKR, NetR and q3map2build, I still insist that there was something wrongly done with those installations of GTKR, NetR and q3map2build. I've been using those tools since I've started mapping for OA (I've even switched flawlessly from GTKR to NetR, which I currently use) and never had a problem with them. The current guides on the wiki should be rewritten, though. Hopefully the Mapping manual will contain better info for GTKR/NetR configuration. And prior to that I have to finish the gamepacks. ctf2: Bots spawned inside of botclip. Looking and floating bug in the areas marked by Gig solved. White glitches in dm5: Won't be fixed. They're pretty complex to be fixed. More tests with mappools performed (also thanks to "callvote nextmap"). They work very well!!!! I think you can add them safely enough. The only one which does not work at all is the "tourney" one. But it seems this is not due to the mappool, but due to some bug in gamecode (if Sago may give a look... ), or simply due to how the "tournament" mode works. Does a "tournament" match ever end? 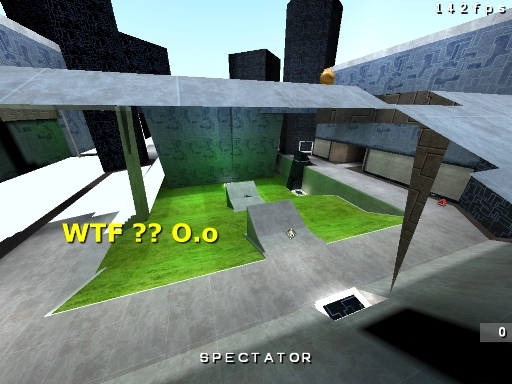 However "/callvote nextmap" with g_gametype 1 causes the same map to be restarted also with default OA 0.8.8 mappoools: the problem is somewhere in gamecode... I suppose we should still include the tourney mappool, so if nextmap for tournament mode will ever be fixed, its mappool will start working. Other gametypes seem to work perfectly, instead. I also compared those mappool files with the map/gametype table in DO NOT LINK[/b]) h t t p s : / / openarena . wikia . com/wiki/OACMP/Volume_1]OACMP1 wiki page, and thus I added oacmpdm5 to Elimination pool file (it was listed in the table -and in the .arena file-, but not in the mappool file). So you can use the updated package you find attached to this post. Changes against yesterday version are just that small addition to Elimination pool, and the creation of a ".txt" file about "OACMP vol 1 auto change map" (not strictly necessary, due to the fact most of those infos are already in the .cfg files... but people may find simpler to open a .txt file than a .cfg file with a text editor): decide yourself if you want to include it. - OACMPDM5 reports two item_health startsolid. - OACMPDM7 (V4-beta version) reports many health items startsolid. (NK-Test version does not). Note for who want to try OACMPDM7 NK TEST (from this post), remember rename "zz_dm7-test.pk3" to something like "_zz_dm7-test.pk3", otherwise the standard version of the map will be used instead. Oh, yeah, forgot to mention. Pelya's reported bugs on ctf1 fixed as well. Might as well upload the pack with all the fixed maps. Well, here's a small fixpack. Includes all the modified/fixed maps (ctf1, ctf2, dm5, dm7, dm9) It also includes the modified, compilable dm4. - oacmpdm4 needs more lighting work. - oacmpdm5 "sparklies", which won't be fixed. - CTF1: Better now, although there are still a few small glitches (see the first three screenshots). In case you compile the map again, what about adding those famous few machinegun ammo boxes in the lateral tunnels? - CTF2: the bots bug seems fixed now. - DM4: Yes, more lighting work is required. However, how's possible that the sky light does not illuminate at all the vertical walls? Maybe some q3map2 options control how much light "bounces" and you disabled it completely, or something similar? It's very strange... However, I may also just live with Akom's original version of this map. - DM5: the view-through polygon bug seems fixed. No, now the problem has just moved a few units below (a different brush), but is still there. - DM9: Maybe now the skybox effect is a bit better (with the dark instead of concrete)... however the upper part of the map is really too dark (I cannot attach more screenshots to this post, however just look at the upper part of the buildings...). dm4: as you've already said, more lighting work needed (ambient light perhaps). dm5: another missing texture on the same place as before, and lighting bugs around bevels. Gig, are we using the same version? dm7: inconsistent lighting at the upper platform, it's pitch dark on one side, and illuminated on other side. dm9: lower area is much better now, and I don't care much about dark upper part of building. Would be nice to fix, but still a minor bug. ctf1: okay now, I've noticed some Z-fighting if you shoot rocket in the middle tunnel, but that's minor. We are using the same version... but in the first quick run with the map, I didn't notice the bug had moved to the brush below the old one (about this, I corrected my post before you posted yours). About (lighiting?) bugs (black dots and lines), probably in the first quick run I confused some of those with some marks on walls caused by weapons. I confirm there are. More, now I also noticed another thing: for some reason, those bevels do not show "marks on walls". All the mentioned bugs makes me even more convinced that good brushwork should always be the rule while mapping. OA3 should definitely enforce good brushwork and patchwork. Apart from better or worse patchwork, I don't understand the reason why your compilings gave such different results than those Jan (and Pelya) got. I mean, I can understand some difference with maps that were previously compiled with Q3Radiant (mine and Akom's)... but Jan's were always compiled with Q3MAP2, isn't it? And I still don't understand why do your compilings have such completely dark areas (like in DM4)... how's possible the sky does not illuminate vertical walls at all? I base the final compile settings (sans -dark and -dirty) on those which appear on the Q3Map2 page. "q3map2.exe" -light -fast -patchshadows -samples 3 -bounce 8 -gamma 2 -compensate 4 -dirty -v "mapname.map"
"q3map2.exe" -flares -meta -patchmeta -skyfix -v -verboseentities "mapname.map"
"q3map2.exe" -light -fast -patchshadows -samples 3 -bounce 8 -gamma 2 -compensate 4 -v "mapname.map"